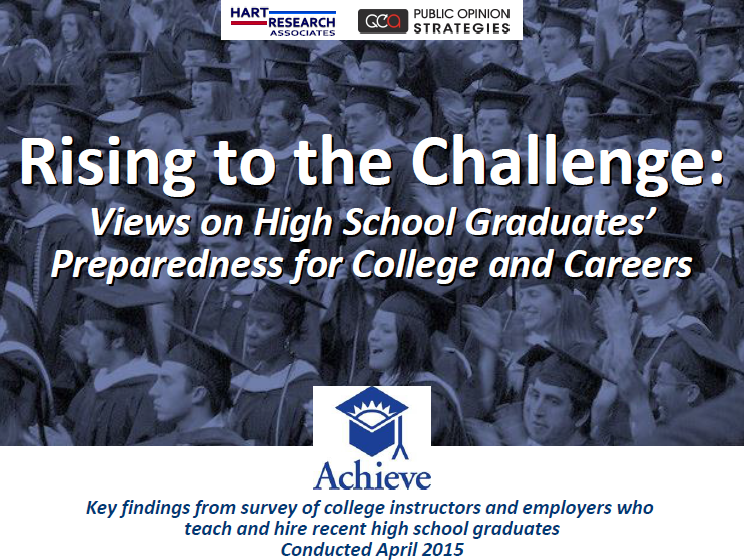 Washington, D.C. — July 22, 2015 — The second phase of a new national survey released by Achieve — Rising to the Challenge: Views on High School Graduates’ Preparedness for College and Careers — shows that 78% of college faculty and 62% of employers believe that public high schools are not doing enough to prepare students for the expectations they will face in college and the working world. This survey builds upon Achieve’s 2014 survey of recent high school graduates about their preparedness for life after high school, which was released in December. The survey, which updates a similar survey conducted by Achieve in 2004, found that more instructors and employers are dissatisfied with high school graduates’ preparedness than were a decade ago. 96% of instructors at two-year colleges reported at least some gaps in their students’ preparation (including 46% who reported large gaps in preparation). 88% of instructors at four-year colleges reported at least some gaps in their students’ preparation (including 34% who reported large gaps in preparation). 82% of employers reported at least some gaps in recent high school graduates’ preparation for typical jobs in their companies (including 48% who reported large gaps in preparation). College instructors also report high levels of dissatisfaction with recent high school graduates’ preparation in key skill areas. More than 75% of college instructors are dissatisfied with their students’ preparedness in critical thinking, comprehension of complicated materials, work and study habits, writing, written communication, and problem solving. Nearly all of these figures are at least 10 percentage points higher than the percentage that were dissatisfied with these areas in 2004. Employers are reporting a significant increase in the need to require that recent high school graduates get additional education and training to make up for gaps. 61% of employers request or require high school graduates to get additional education or training to make up for gaps in their ability to read, write, or do mathematics. This represents a 19 percentage point increase from the 42% that reported that their new employees needed additional training in 2004. Despite the shortcomings in preparation, there is broad agreement between college instructors, employers, and recent high school graduates about which proposals have the potential to improve preparedness for life after high school. 38% of college instructors, 50% of employers, and 56% of recent graduates believe that communication early in high school about the courses needed for college and careers would greatly improve their preparedness. 33% of college instructors, 44% of employers, and 50% of recent graduates believe that opportunities to take challenging courses (i.e. honors, AP, and IB courses) would greatly improve their preparedness. 33% of college instructors, 57% of employers, and 63% of recent graduates believe that opportunities for real-world learning would greatly improve their preparedness. Please click here to view a slide deck that examines the full set of survey results. Rising to the Challenge: Are High School Graduates Prepared for College and Work?